If you are curious as to if your university may be haunted, here are some dead give-aways: Graves on campus, old theaters, a war-laced history, drafty buildings, and towering halls that once housed human cadavers. If that sounds familiar, it’s because UW-Madison happens to have all of these. A chilling history that makes the university’s campus fertile ground for haunted legends has inspired the local company Madison Ghost Walks, which gives ghost tours in October around Madison’s capital square, to look into expanding their business in the next few years. The new tour would include a separate ghost walk focused solely on the supernatural legends associated with the UW-Madison campus halls, buildings and landscapes. Mike Huberty, the founder of Madison Ghost Walks, has been in the process of collecting stories for the potential new tour-guide service. Huberty believes a ghost tour would be a way to inform anyone interested about the “weird stuff” on campus in edition to the history of the University. Lisa Van Buskirk, a tour guide at Madison Ghost Walks, is passionate about the idea of creating a UW campus-focused ghost tour. The collection of ghost stories Van Buskirk refers to are drawn from UW-Madison’s campus folklore. According to several student newspaper articles and the book “America’s Haunted Universities” by Matthew Swayne, spirits have been reported lurking in Science Hall, Memorial Union’s Theater and Bascom Hill and Hall. Photo by Molly Hanson Science Hall, supposedly home to a third-floor ghost, once housed human cadavers for the university’s anatomy department. buildings. The building, which once housed the university’s anatomy department, allegedly held a collection of cadavers and other human remains in its attic, and can expected to be featured in the future campus ghost tour guides. one’s been reported for years,” said Van Buskirk on the infamously haunted building. Of the legends associated with the campus, the university’s hallmark, Bascom Hill, stood out the most to Swayne in his research and writing on UW-Madison’s “ghost-lore”. There have been paranormal investigations done on the Bascom Hill area by a research group known as Mad City Paranormal in recent years. Ian MacAllister, a local psychic-medium who assisted the group in several investigations on campus, discovered spirits roaming certain buildings in the area. Of these was South Hall which was once an all-women’s dorm in the late-1800s. According to MacAllister, when the group later reviewed their tapes of the investigation, the voice of a woman whispering the name of a group member was heard on audio. 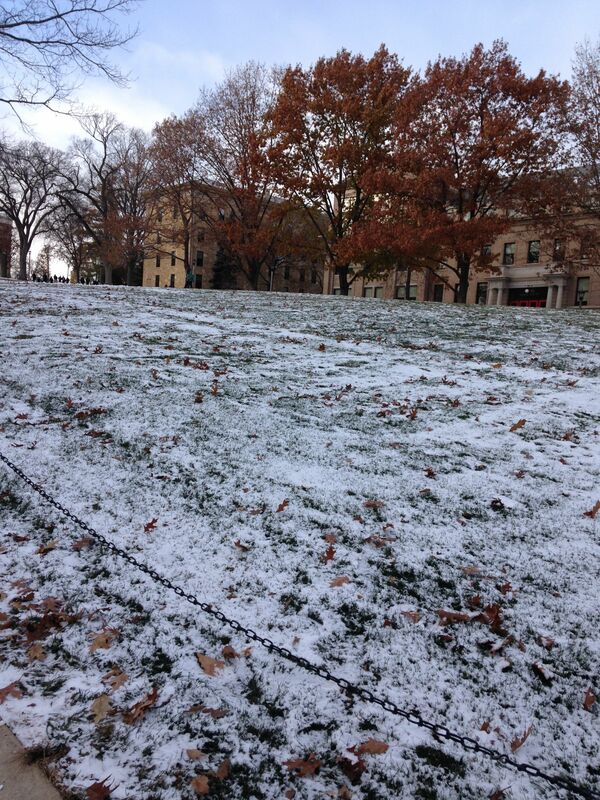 The grassy area of Bascom Hill is supposedly haunted ground. In the grassy area of the hill, between North and South Hall, MacAllister picked up on another presence. If your wondering if you may be in the company of a supernatural entity while on your way to class, there are a few common cues. The most reported sign of a spirit’s presence heard on ghost tours, according Huberty, is the feeling of being watched. MacAllister provided other tips for how non-mediums can pick up on a prowling ghost. Swayne emphasized that ghost stories possess value in connecting students to a collected experience of the school they attend. Similarly, Huberty believes the history and folklore education that his ghost tours provide help to fuse a meaningful connection between an individual and a place. But, if you are a believer, as Huberty, Van Buskirk, MacAllister, and even Swayne claim to be in varying degrees, then a campus ghost-walk might also provide you with a safe community to “get weird” with and open up about your personal spooky experiences. Or, just maybe, share your very own encounter with a solider roaming the leaf-littered grounds of Bascom Hill on a chilly autumn morning.